When I saw this recipe in the most recent issue of Cooking Light, I knew right away I wanted to try it. Bacon is one of the main food groups at my house (or I should say, the kids wish it was). 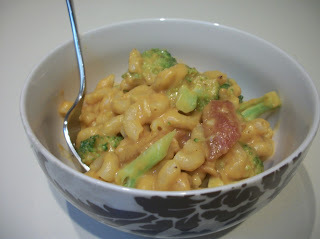 They eat broccoli pretty well and like mac and cheese so I was pretty sure it would be a hit. But this recipe had a secret ingredient: pureed butternut squash to amp up the vitamins and also cut down on the need for cheese. Would this really work, I wondered? Could I "fool" my kids into thinking this was normal mac and cheese??? The answer: a resounding YES. After searching several grocery stores unsuccessfully for frozen, pureed squash, I ended up subbing pumpkin. It adds the right color and creaminess not to mention added vitamins, as I said above. And my kids (2 teens and 1 tween) ATE IT UP!!! One even had seconds, which is unusual. This is the perfect autumn comfort food and a great weekday dinner because it all cooks in ONE POT. Serve it with a nice salad and some apple slices and dinner is done. And it ticks all my little bullet points above. Score. Find more great stuff at Inspire Me, Inspiration Monday, Mix it Up, Clever Chicks, Create Link Inspire, Tasty Tuesday, Hearth and Soul, What's Cooking. Heat a large skillet over medium-high heat. Add bacon; cook 4 minutes or until crisp, stirring occasionally. Remove bacon from pan. Then remove all but 2 tsp. of bacon drippings from the pan. Add garlic to remaining drippings; saute 30 seconds. Add chicken broth, milk and squash; bring to a boil, stirring occasionally. Add pasta; cover, reduce heat and simmer 5 minutes, stirring occasionally. Stir in broccoli; cover and cook 3-5 minutes or until pasta is done and sauce is thickened. Stir in salt and pepper to taste and most of the cheese. Sprinkle bacon and remaining cheese on top. Cover; let stand one minute. Makes 6 servings. It looks yummy! Thanks for sharing. 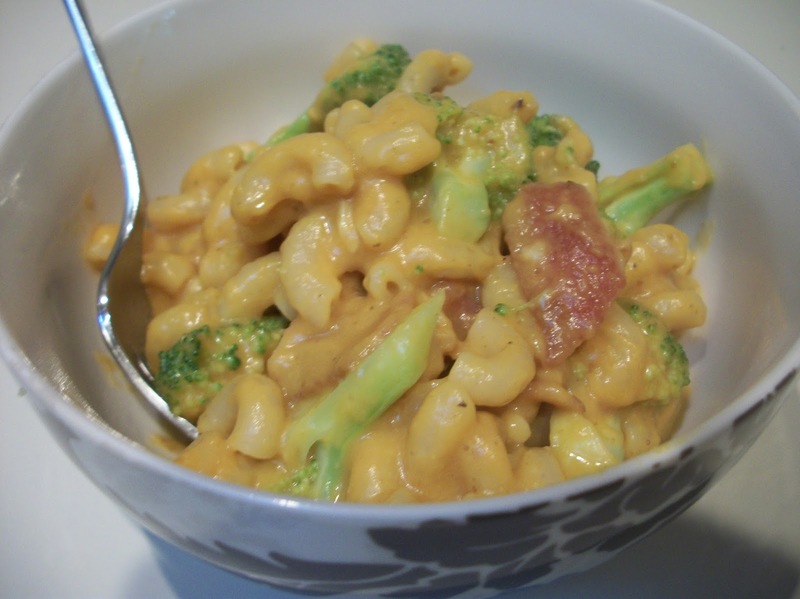 Looks good, Broccoli, bacon and Mac and Cheese, sounds like a great dish. Thank you for sharing with the Clever Chicks Blog Hop! I hope you’ll join us again next week! Your Broccoli Bacon Mac and Cheese sounds fantastic, Sara! I love how wholesome it is with the squash or pumpkin and it's got so much flavour too. Thank you for sharing it with us at the Hearth and Soul Hop!